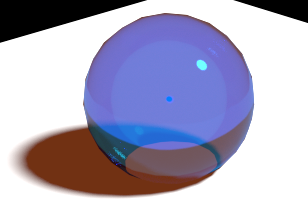 Prompted by a question in a comment by Joakim Poromaa Helger I came up with this approach to emulate Rayleigh scattering (the effect that turns the sky blue and the sun red at the same time) in Cycles: by combining a transparent and a glass shader. In the picture above there is a bright white sun on the right. In a material that exhibits Rayleigh scattering (like air) blue light is scattered more than red light. That means that light traveling from a lightsource through such material will be tinted red because blue light is scattered to all sides. In a direction away from the direct path of the light we see just this scattered blue light and not (or much less) the direct light. 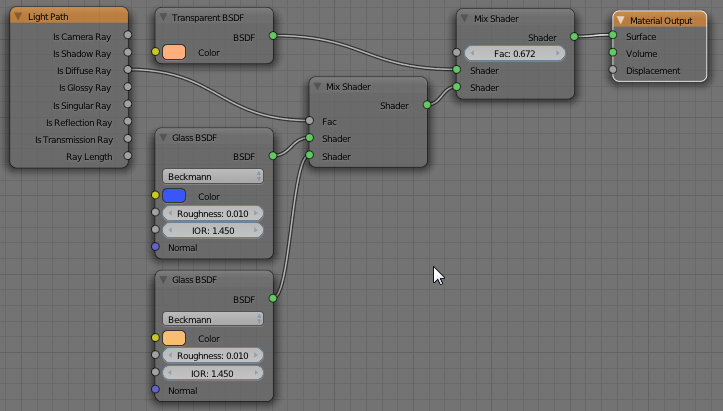 (Note that this image took 10,000 samples and the caustics are still very noisy. Clearly caustics is not Cycles strong point. The light/shadow inside the orb are due to the fact I placed it slightly below the ground but am to lazy to fix it). Now obiously the effect here is exagerated for demonstration purposes and arguably it is not a real simulation of Rayleigh scattering but for artistic purposes this might be a good start.